1 If your parents ask you to brush your teeth, you probably do it. But if a puppet shaped like a tooth asks you to brush your teeth, would that be more fun? Puppets make everything a little more exciting. They are a living art form. Puppets can make anyone smile, giggle, even do tasks that they don't like too much...like brushing his teeth. 2 Puppets have been around for centuries because they are so versatile. Puppets have been found in children's graves in ancient Greece. The cultures of Japan, China, and Indonesia include puppets of different kinds. The Hindus of India believed that their sacred puppets had lived with the gods. In Egypt, the high priest used a puppet with "supernatural powers" who supposedly spoke the words of an Egyptian god. Priests taught medieval Bible lessons with puppets. 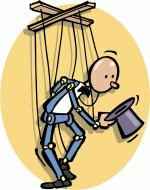 The word "marionette" comes from a form of the name Mary because the priests used a puppet of the Virgin Mary in their lessons. 3 Puppeteers have used their craft to entertain and to teach. Today, both children and adults enjoy making puppets. Puppets can help people express themselves. A shy person can speak a lot more easily if he or she is playing a part with a puppet. Children can even talk about things that worry them if they use puppets. Speech therapists and psychologists use puppets to help children. Puppets can help teachers with their lessons in many subjects.